The Blue Cedar Grove. It’s a title that stirs the imagination, kind of like The Golden Spruce, I remember thinking, when I first read the words. I never did remember to ask Ralf Kelman exactly why he’d chosen such a name, but as soon as I saw it on the Western Canada Wilderness Committee (WCWC) map, I knew that I needed to see these trees! The first trip I made to this grove was hardly a day filled with great inspiration. It was a one of those spring days when it’s hard to anticipate what way the weather is going to turn. In short, I guessed wrong. Only half an hour into my bike ride up the valley, light rain began to fall, escalating into a torrential downpour by the time I had left my ride to hunt for the trees. I did decide to press on, but it seemed the further I walked the harder it poured! I made it as far as a soaking wet, moss covered boulder field before I conceded defeat. A day when you could not keep the water off your camera lens! It was four years later in 2008 that I finally returned. On that occasion I chose perfect weather, with the sun shining warmly on my birthday, no less! In a scant twenty minutes from where I left my bike I reached the grove, which certainly did not disappoint. There it was, the moss covered boulder field where I had begun my retreat several years before! Tall and towering cedars, draped in moss, set the scene. The forest floor and understory were a carpet of innumerable greens, though it was far from easy to decide where to place your next step. In this case, moss grows on the east side of this big cedar! If you like marked trails with few obstructions, avoid hiking with me! I was quite surprised to also find a number of very nice Douglas Firs interspersed here and there, and along the creek a number of massive Bigleaf Maples held court, shading me from the midday sun. Nearby, a quizzical deer observed me clambering about, no doubt wondering what in the world I was doing there! The sheer volume of their foliage is overwhelming! After enjoying the grove, I was soon drawn uphill, following the dull roar of water that I could hear in the background. When I found the source of the noise it was a surprise to me. A winter avalanche had roared down the creek canyon right down to an elevation of 500 meters. By the month of May the snows had melted out and the creek had created a cavern beneath them, leaving me something highly unique to explore. I dared not venture inside it, though, as I could hear the creaking and groaning of shifting ice echoing from within. O’Hayes Creek as seen from a helicopter. Credit to Doug for this photo, which really gives you a different perspective! A truly unique place, and one I’ll never forget! The ice cave back in 2007. For scale, the opening is, or was, seven feet at its tallest. I did not go inside! The sounds emanating from within were intimidating to say the least! Having finally run out of time, I descended the gully once again, vowing to return. The next decade, however, would have a lot to say about whether that was going to happen, but suffice it to say that I was a very happy hiker on that sunny afternoon in late May! This territory is about as rugged as it gets! In 2018, I would finally return again, on another absolutely resplendent day. I knew that soon I was to be moving away from the North Shore Mountains, and the Blue Cedar Grove compelled me to visit one more time. The day of discovery was a rewarding one, as I found several sizeable Pacific Yews , hiding in plain sight as they always seem to be. One of them was so twisted and gnarled that I named it “The Elk”, for its upper branches that gave the appearance of antlers. Introducing “The Elk”, one very interesting Pacific Yew! I will never forget having lunch on the banks of O’Hayes Creek that day, warmed by the sun as countless birds sang nearby. It may seem trite to say I feel as though I’ve developed a bond with this place over the years, but I can’t think of any other way describe it. It is, without a doubt, one of the Seymour Valley’s special places. Here is a guided tour of what I experienced that day. Spiky treetops usually mean old growth trees! When a giant falls it can either be quite a roadblock or a highway for escape! Imagine, if you can, the Seymour Valley in the late 1800s. It was a land almost completely undisturbed, abundant with wildlife, and blanketed with one of the finest coastal temperate rainforests this land had to offer. With the influx of settlers and the further displacement of indigenous peoples, however, everything changed. Much of the valley bottom timber was harvested, and the majority that remains many years later is in the stages of recovery. There are, however, places that do remain relatively pristine, and I’ve made it a passion of mine to search for them. The Blue Cedar Grove certainly possesses that magic in abundance, a place that always fills me with gratitude. Should you take the time to seek it out, I’m sure you’ll agree! 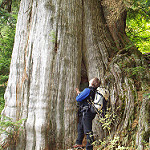 High in British Columbia’s Seymour Valley, in a broad clearing once razed of vegetation by landslides, is a most incredible tree that I call the Squamish Creek Giant. It’s a massive Bigleaf Maple that grows right along the creek bed. Rising above it is a rugged coastal valley that has seen little if any exploration, in no small part because its terrain is so difficult! I’m not sure exactly why the creek is named Squamish, by the way, as it is not near the well known city by that same name. Bigleaf Maples like these are often 400 years old! Upper crowns of Bigleaf Maples are incredibly productive! In the coastal forests of the Pacific Northwest, Acer Macrophyllum, as it’s also known, is a relatively common tree, usually native to riparian zones. Generally it will have multiple trunks, and tends to support a wide variety of plant life that grows from its limbs. Just because of its crown spread, it can be difficult to photograph on a tree hunt, and its lifespan can widely vary. The largest of its kind is reputed to reach over five hundred years in age, but many seldom reach half that age, perhaps due to the state of flux they endure growing near watercourses. These trees are hard to photograph but I love to try! I have not explored much of the forest above the cascades. Who knows what’s hiding there?! This particular tree is one I stumbled upon at least a decade ago, and we returned to photograph last year. It’s quite close to an especially captivating place I call The Giant’s Rock Garden (story is here ). Lately my interest about other Bigleaf Maple trees has definitely been on the rise. I have encountered many of them, but it has usually been when I am hunting other species, like Western Red Cedar or Douglas Fir. Has anyone else out there developed an interest in these beauties? Feel free to leave your comments if you have! Only a few pages of the 2007 calendar were to turn before favourable spring weather had us thinking about a return to Kennedy Creek. It was the first day of April when Chris and I began our early day hiking along the Cedar Mills Trail in Lynn Headwaters Park. The idea, this time, was simply to try and cover some ground we hadn’t the first time. Would we be April fools? Well, yes, but read on and find out how! On reaching the Third Debris Chute, the first mission was fording Lynn Creek. A word to the wise and wary: you have to be comfortable with cold, fast moving water, especially when you do this in spring. Your trip can easily be over before it begins as sometimes it’s simply too dangerous! Techniques will vary. Sometimes I will leave my boots on and walk straight across and sometimes I carry my boots. I recommend hiking poles or finding a long sturdy branch to help with balance as well. Last but not least, put your cameras in a resealable plastic bag and pack extra clothing in case you end up going for an unplanned swim. A climbing helmet is also not a bad idea not only for the creek crossing but also for all the clambering over rocks and logs you’ll be doing! Not sure if I was smiling here or just chattering from the cold! Chris had reasoned that on this trek we ought to work our way up to about the 450m elevation mark then traverse north toward Wickenden Creek. This made sense as then we would cover exploring the belt of forest just below the one we had walked the first time. No sooner were our boots back on after the ford than we were faced with the unexpected fast moving waters of lower Kennedy Creek, but we managed to steeplechase that with minimal difficulty. Once past the creek it was a matter of bashing our way uphill for about half an hour. On our first trip we had followed the crude flagged route that heads west up to Kennedy Falls after you cross Lynn Creek but on this day we were well north of that line. Morning mist drifted through the trees as the sound of the rushing torrents faded. Silence descended, and almost magically we were again among the giants. Normally we think of ourselves as tree hunters, but on this excursion, as with the first one, the trees were more or less finding us! I was surprised by the sheer number of them as much as anything else. This was a stand of forest in which many trees had reached way over 400 years in age. If a tree falls in the forest, I still have to climb over, under, or around it. This fallen cedar was quite a blockade! The quietude was interrupted from time to time by the rhythmic sounds of a nearby woodpecker building a home, and punctuated by the occasionally inane Simpsons’ banter that seems to follow Chris and I wherever we go. On we thrashed, in the direction of an unnamed creek not far south of the Wickenden drainage, with plenty of distractions along the way. Find after find, could this day get any better? It’s all a blur now. Another half hour passed, and we found ourselves in a steep creek gully that was peculiarly bright and open. On subsequent trips I discovered that avalanches are not infrequent there, as the gully is at the bottom of a chute that shows evidence of very forceful slides. For a moment, I looked uphill, where I could see the spiky tops of more ancient cedars, then downhill, where I could see the The Needles in sharp relief across the Lynn Creek Valley. Where to go next? In proof of the old saying “You can’t see the forest for the trees”, suddenly Chris was on his way up the chute, saying “I think we have something here!” And so he did! It was a huge western red cedar, most likely about 500 years old yet relatively young in appearance judging by its trunk wear. Because of where it was growing it was difficult to say exactly what its diameter was was but it was definitely in the neighbourhood of 15 feet wide, perhaps more. What is likely is that if it reaches the age of the oldest trees in the park it will almost certainly someday be among the largest. Here are a few looks at this grand old specimen! Just figuring out where to measure it took a lot of time! One of my happiest moments. We named this tree the Kennewick Giant. Photo by Chris H.
Well, that tree had certainly made our day memorable, but as it turned out the walk home delivered just as much wonder! We were now at an elevation of roughly 350m, and so opted to follow that lower line back toward the Kennedy Creek again. Mylar balloons…I have found countless samples commemorating almost every occasion and birthday. Someday I’ll write a story about them all! Not to sound trite, but this was one of those days that has you really appreciating the wonders of nature. I advocate responsible forest management but I find it hard to understand that some people would only see this forest in dollar signs. In this day and age there is really no excuse for harvesting old growth forest. Thankfully, Lynn Headwaters Regional Park has seen its last logger. Midday gave way to afternoon, and we decided to stop for lunch near a tree both of us nearly walked past. Life was good. Half an hour later we were making our way across lower Kennedy Creek again. The waters were flowing even harder than they had been in the morning, which is typical of creeks during the spring snowmelt. We had just crossed the creek when I spied something odd lying on the ground and picked it up and showed it to Chris, who exclaimed “What? No way? !” It turned out he’d lost his lens cap on a previous excursion to the area and had been doing without it for some time. And they say it’s hard to find a needle in a haystack? Not for me! A short time later we were crossing Lynn Creek again even as we planned our next adventure. Several hikers were having lunch on the other side and from their bemused looks they were no doubt wondering where in the world we had come from. It had been another successful day! Stay tuned for the next chapter, because the story is far from done! Over the years, hiking and snowshoeing in Mt Seymour Provincial Park has occupied a lot of my free time, and, if you ask me, very few parts of the park can capture your heart the way the Suicide Bluffs do. It’s become something of a tradition for Doug and I to make it up there once the snow falls. While it’s not an entirely unknown area, it does tend to be a lot quieter. Why? Because the sometimes complicated route finding and difficult micro terrain can be challenging. Like anywhere in the Coast Mountains, all the usual cautions apply, especially in winter. Maybe the name, too, is something of a deterrent. I don’t know exactly how these bluffs earned their auspicious name, but there are certainly a number of intimidating cliffs on the bluffs. The Suicide Creek drainage nearby even features a pair of waterfalls known for their death defying drops as they plummet to the Seymour Valley below. We generally access the trail by first hiking to Dog Mountain, then branching onto it just before the lookout. Then we make our way eastward to where the route links eventually with the main Mt Seymour Trail. While I call it a trail, it definitely stretches that definition, as even in summer this convoluted route uses ropes and chains to help on some of the steeper sections. In winter, you have to be prepared for full on mountaineering. It’s not a place for the uninitiated, or for those expecting an easy and well marked track, so gear up appropriately if you go! We usually bring ice axes, snowshoes, and crampons as well as a GPS, compass, and maps. Clouds and fog can move in quickly as well, challenging your visibility. The views are 360 degrees from all of the summits. You can see Mt Baker down in Washington, all of the Vancouver area and harbour, as well as most of the North Shore Mountains. In summer it’s still a beautiful hike, but it’s in winter that it truly shines! My own history with the area actually began far below in the Seymour Valley, where I started with a hike with some friends to lower Suicide Creek. We explored an old logging camp near the Spur Four Bridge in the Lower Seymour Conservation Reserve (LSCR) where there was once an incredible ancient forest. I would also return later to the valley with regular hiking partner Doug on several occasions to explore and maintain the rough track that leads up to Suicide Falls. North Shore Rescue has used this route to save wayward skiers and snowboarders on more than a few occasions. The Suicide Creek Valley is rough, vertically steep in places, and under some conditions downright hazardous due to its frequent landslides. The two photos below here pretty much sum up the kind of hiking you get into on that trail. But I digress. Only after I explored these lower reaches did I actually hike the Suicide Bluffs Trail, some 400 metres above the falls, and 800 metres above the Seymour River. 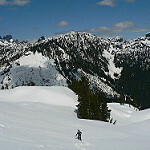 The trail is entirely within Mt Seymour Provincial Park. The first hike was so much fun that Doug and I began to make the bluffs an annual winter destination. When we go, we’re very careful about choosing the right conditions, especially in winter, both in regard to the snow conditions and to visibility. We’ve learned that it’s more prudent to ascend the steep slopes from west to east because those same slopes are usually much more precarious to descend during those times. In that way, we get to do a little more climbing too, which we prefer. In summer, we have hiked it in both directions. The forest of Suicide Bluffs is predominantly mountain hemlock, sprinkled with the occasional yellow cedar. Some of those hemlocks are well over 500 years old. Interestingly, unlike the the trees of the lower valleys, they don’t tend to garner a lot of attention from conservationists. Perhaps because they are out of sight to many, they are also out of mind. There have been precious few studies devoted to their longevity as a result. All that said, here are some images from our most recent hike on New Year’s Eve of 2015 and from some of our previous treks in other years. On a good day you can also see Mt Garibaldi, Mt Baker, and much of the Britannia Range in addition to most of the North Shore Mountains. Over the years, it isn’t surprising that we have come to see Suicide Bluffs as our favourite winter stomping grounds. There is something about standing high above the treeline in fresh snow and looking at so many places that you have been lucky enough to visit. In twelve years we have hiked, climbed, and thrashed our way through countless North Shore valleys, and these bluffs afford fine views of many of them! If you’re looking for a local winter hike that still gives you that wilderness feel. and you have already honed your mountaineering skills, then make your way to the Suicide Bluffs. I guarantee you’ll enjoy it well! Well it’s December here on the west coast and finally winter has arrived in earnest. There has been snowfall in the North Shore Mountains lately like we haven’t seen in years. Trouble is, everyone has been set on enjoying it at the same time, so it took a little planning for Doug and I to figure out the best way to enjoy one of our favourite local haunts without having to brave the crowds. Rather than join the throngs of humanity up at the ski resort area, we decided to take on a somewhat different approach. Knowing that the snow line was relatively low, we opted to begin our trek somewhat lower on Hollyburn Mountain. The destination? A walk through the old growth forest of Brothers Creek up to Lost Lake and West Lake. As it turned out, we had the best of all worlds: relative solitude, enjoyable weather, a decent navigational exercise to work through, and plenty of untrodden snow to play in! The trek began on Millstream Road at the trailhead for the Brothers Creek Fire Road. It wasn’t as cold as we thought it might have been, so we were able to dress fairly lightly for a winter trek. After about half an hour or so, we were already in the midst of old growth forest at an elevation of about 600 metres. It was a narrow escape for the cedars here at the turn of the twentieth century. In the early 1900s a full scale logging operation ran for quite some time, one of the first to use large steam donkeys as engines and incorporate the use of incline railways. However, a collapse of the cedar shake market put an end to all of that prosperity, and years later when it did resume easier sources were sought. The lands are now owned by British Pacific Properties and managed for public use. Soon after, it was that this valley, then called Sisters Creek after the two prominent peaks then called The Sisters (and now called The Lions), was renamed as Brothers Creek. Logging has pretty much ceased since therearound 1912. 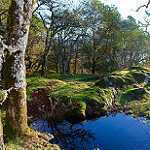 Hiking there gives one the ready opportunity to see sections of ancient forest which are almost intact to this day. To see these trees clad in winter snow is especially worth the effort! But beware, unlike its distant cousin the yellow cedar, the western red cedar is not built to hold snow and usually sheds it quickly and without warning. We had to pay close attention to falling snows, hence the title of this entry. The old fire road makes its way up to a bridge that crosses Brothers Creek at about 720 metres and joins the Brothers Creek Trail that meanders the other side of the creek. Our destination though, was Lost Lake, one of the small subalpine ponds that dot the lower reaches of the mountain. There is a well marked route that leads into Cypress Provincial Park and on this day it had been trodden as far as the lake. The silence was conspicuous once we reached the lakeshore, with nobody in sight and blue skies above the trees. We stopped briefly at the lake to reconnoiter our route, as from that point on we would be breaking trail in two to three feet of new powder snow! In the Lost Lake area, the silver fir and mountain hemlock dominate the forest, along with the yellow cedar. Doug got out his GPS and we decided to head up the mountain to West Lake, once the site of an old ski lodge. My memory of the trail was a bit vague, but we both knew that it wound its way into the upper valley of Brothers Creek and then crossed over the creek into the West Lake drainage. As it turned out we ended up taking a partly new route to the lake, where we stopped for lunch. Before that we managed to step into a few big snow holes and managed a difficult creek crossing. Somewhere along the way I lost one of my snowshoe straps, which made walking a bit more difficult but not especially hazardous. There was much to talk about as we hiked as we’ve had a long history with the area over the years. At one time you could hope to see a Northern Spotted Owl on these trails but as it’s very elusive that’s not too likely. 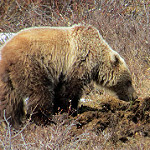 I have, however, run into black bears and pine martens occasionally and have seen signs of deer, rabbits, bobcats, mountain lions, and even a wolverine. Woodpeckers, barred owls, and Douglas squirrels are commonly seen as well. Once we’d had enough to eat we decided to make our way down the West Lake Road to the Baden Powell Trail. In summer that’s easy to do but it took some doing to find the junction where the trail crossed the road as the signpost was almost buried. Once we got that out of the way it was clear sailing. We hiked down to the Crossover Trail with the intention of heading back to the Brothers Creek Fire Road. Travel was fast, with only a brief respite or two, including one at the bridge where the trail crosses Brothers Creek. Only weeks before, we had hiked this trail in the total absence of snow, so it was interesting to see it in such different conditions. Before we knew it we were back at the truck once again headed for home, filled with new memories and images of a place so very familiar to us both. The last day in July found Doug and I riding the Solar Coaster Chair up Blackcomb Mountain for the third time in three years. At ten in the morning the temperature was already hovering around 25 degrees, and light winds were keeping the smoke from distant fires away, at least temporarily. We were headed for The Spearhead, a lofty peak at the confluence of three sizable glaciers and not far from the summit of Blackcomb Mountain, which we had visited two years ago. In winter and early spring, it marks the start of the well known Spearhead Traverse, which is a popular ski mountaineering route. As treks go, this one was not among the most punishing, as you save well over a thousand metres in elevation gain by riding the chairlift up. You do, however, have to move quickly in order to be on time for the last ride down. Basically, you walk a well groomed track until you get to Blackcomb Lake, then swing your way into and up a long and steepish gully between Blackcomb Mountain and Disease Ridge to gain the basin that contains Circle Lake. From there, you scramble up to the col between Blackcomb and Spearhead, and then it’s a reasonably short scramble to climb The Spearhead. Despite my title for this diatribe, The Spearhead is not really all that difficult to find, truth be told. As we rode up the chair we couldn’t help but notice how dry the lower valley was, as of course there had not been much rain for weeks on end. At roughly 1030 am we were on the trail, at over 1800 metres in elevation, and reached the lake and boulder fields around an hour later. On our previous expedition to Blackcomb Mountain we had taken to the rock too soon, which made gaining the gully more time consuming. This time we resolved to follow heather and treeline until it became absolutely necessary to hop boulders, which turned out to be a better approach. Once you’re in the gully, there is a beaten track which runs up the shoulder of its left side, which made for easier travel until we could move toward the middle. Views of Whistler Mountain, the Overlord Group, and Black Tusk helped to distract us from the hard work involved. Inevitably, though, there was plenty of loose rock we knew we had to deal with, and soon we were battling through fields of blocky granite and patches of snow. On this excursion, our strategy was much more well thought out, and in no time we reached the basin above. My memories of this place were still quite vivid, yet somehow managed to exceed my expectations. Circle Lake was a shining shade of blue in the basin below, and the newly formed lake at the foot of the Trorey Glacier definitely seemed to have grown since we had last seen it. The air was clear, and you could see sharply etched crevasses on the glacial ice. We lingered for a while, then continued on to the col above, grinding our way up still more loose rock. The skies were a nearly impossible blue. Arriving at the col, we could see the route we had walked up Blackcomb Mountain two years before, and the summit of Decker Mountain, on which we had stood with good friend Denis the year before. Now we focused our attention on the ridge leading toward The Spearhead, which seemed fairly straightforward. First it was a matter of hiking over the top of the first section, then looping behind and to the right to bypass a gap.From there it was necessary to drop down to the left and traverse below the crest of the ridge so that we could cross a snowfield above the Horstman Glacier. In a matter of minutes we stood a hundred metres or so below the summit of The Spearhead, which, not surprisingly, consisted of, well, more loose rock! The objective is in sight! As we ascended I noticed something of a left to right trending ramp, so we followed that upward. Finally, there was nowhere higher in sight, and we spied an inconspicuous cairn. We could go no higher, and had reached the summit! Superb views were everywhere. The other side of the mountain dropped sharply to the massive Spearhead Glacier, with the unmistakable bulk of Wedge Mountain staring us down. Cook, Weart, the Armchair Glacier, The Owls, and Lesser Wedge could also be seen as well as Mt James Turner. Looking back down into the basin, the Overlord Group was also visible in behind Pattison, Trorey, and Decker, with the icefall of the Cheakamus Glacier in the distant haze. As I looked down the Horstman Glacier I could see all the way down to Green Lake. Blackcomb Mountain, and part of the Mt Currie massif loomed large, while Rainbow Mountain and Ipsoot were almost hidden in the smoke. 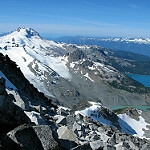 One could also see the mountains of the Squamish and Elaho Valleys, with the sharp spike of Ashlu being most prominent. This was an outstanding place to stop and break for a satisfying lunch. Even cellular reception was strong, so that Doug was able to contact his wife in the valley below so she could ride up and join us for refreshments. It was now time to begin the race to the beer garden! Much as we imagined the thought of cold beer giving us wings, which it usually does, the long, shifty, and convoluted route back to Blackcomb Lake and beyond still took us a couple of hours. As we reached the lake and looked back toward Blackcomb Mountain, we could just make out a large group of hikers tackling the west face of Blackcomb Mountain. It’s a tricky and exposed route with plenty of rockfall, but the group was all over the mountain and seemed like they might get into some trouble. It turned out they were just fine in the end, so we continued on with our quest for beer. All in all, it was another fine day in the hills. This area is well known but still seems underrated, if you ask me. The hiking is decent, and camping possibilities in the basin are even more enticing. In memories of Easters past, there will always be one, for me, that stands out from the rest. Most recollections of this holiday are marked by the gathering of families and friends, feasting on turkey, and catching up on everyone’s trials and tribulations. Then, however, there was Good Friday of 2006, and the day that was spent climbing Mt. Bishop in the North Shore Mountains. Weather had been variable that week, with days of sunshine interspersed with others of torrential rain. That’s typical of life here in southwestern British Columbia, where an April day can be as unpredictable as it is breathtaking. Doug and I had made plans to tackle the mountain with a reasonably early start, with the idea that we might have adequate time to do some required trail maintenance along the way. We arrived at the trailhead at about 8 am, and early morning cloud had given way to blue skies. It was a welcome excursion for us both, life had been stressful of late and time in the hills had been in short supply. As winter conditions were expected in the alpine, we packed ice axes, crampons, and snowshoes just in case. The trek began with a stroll to a grove of ancient cedars, which we had both seen a number of times. I never get over the novelty of west coast hikes, truth be told, and I’m one of those hikers that enjoys a repeat visit to any location. There is always something different to accompany the familiar, so to speak. Trail conditions were excellent, though we did remove some deadfall and rocks, repair some ropes, and improve marking in some sections. North Shore Rescue uses the Bishop Trail as an evacuation route on occasion, and so it’s important that the route stays in good condition. No snow was encountered until reaching nearly a thousand metres and we stood on the shores of Vicar Lake in just an hour and a half. It was a cinch to walk across the still frozen lake and soon we were making for the alpine, with only four hundred metres in elevation to gain before the summit. As we broke into the clear on the ridge, we had a chance to witness something very peculiar. Heavy rains had formed deep runnels in the surface snowpack, giving it a grooved appearance. This is something you rarely see, and when you do it is usually under spring conditions. All of that made for interesting scenery as we bore down and dug in for the summit. In another thirty minutes we crested the high point of Mt Bishop and enjoyed some lunch, more sunshine, and tremendous views with very few clouds. It was as perfect a day in April as it gets. On the way down we took turns climbing up and down the last pitch just to do some extra glissading before hiking back to the trailhead again for beers. It really had been a good Friday on Good Friday, better than good, in fact. Here are a few more views taken at the summit. On a clear day it’s a beautiful place to be! Happy Easter to you all, I hope you enjoyed the read! Sun God Mountain… The name has a definite ring of authority to it. I had been intrigued by the destination for some time and wondered what could be seen from its summit. Both Doug and I had seen the peak from Birkenhead Lake on separate camping excursions and that was enough to sow the seeds for a new adventure. It was then July of 2011. Following a somewhat discouraging evening of torrential downpour in our hometown of North Vancouver, Doug and I nevertheless found ourselves in the Birkenhead area July 8 on a cool, unsettled summer morning. The goal was to drive to the Birkenhead/North Tenas Branch 8 junction, park the truck, and ride our bikes packed with overnight gear with an eye toward camping in the Sun God/Seven O’Clock col. The road above, apparently, was blocked by deadfall and impassable even for high clearance vehicles. It took three hours to complete the drive. Almost unwillingly, we geared up, with about as much enthusiasm as you’d expect after waking up at 4 00 am and after, in my case, roughly four hours of sleep. Now it was time to grind our way up the logging road and its ninety two waterbars! Heading uphill with a lot of gear! The ride uphill was quite a test, and certainly the hardest part of our trek . We arrived at road’s end by about 12 30 pm, later than we’d hoped but still on good time. After a brief stopover spent devouring sandwiches and eating jelly beans, we took care to cache our bikes carefully in the woods nearby. The weather still seemed ominous as dark clouds drifted around the Tenas Creek Valley. Mt Ronayne and its subpeaks were the dominant views, as we considered our chances. Onward and upward! It was time to take to the forest. With a useful GPS track from our friend Ryan, and descriptions from Matt Gunn’s Scrambles in Southwest B.C. in hand, we battled our way uphill. If you keep left of the creek on your ascent, you’ll pick up the occasional marker that helps blaze the way. Snow patches were still evident once we hit 1450 metres in elevation and going was slow as deadfall and postholing were the norm. We were still more concerned about the weather, however, as black clouds now hung menacingly above us. For some reason I jokingly decided they were going to clear, which they did, miraculously. At roughly 3 30 pm the col was reached, and it was a relief to throw off our heavy packs for a spell. We chose to set up camp on a dry, rocky island of krummholz with its own personal creek for water, enough trees, and a huge boulder to serve as a windbreak. The view from my tent door. This is why I love the mountains! First signs of spring life! Next it was decided we’d get in an early dinner then shoot for climbing Sun God after that. Doug fired up the stove and we feasted on tortellini, set up the tents, and buried six Granville Island IPAs in the snow nearby. Life was improving all the time, as the Sun God cleared the skies while we took in some views. It was about 5 pm when we set off for Sun God, about 500m more in elevation gain and some distance away along the ridge. 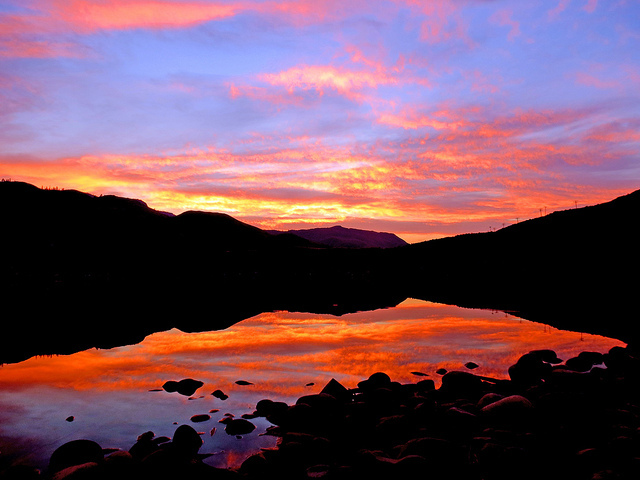 The shadows were shifting in the sky, and the light put on a fine evening display in all directions. As we gained height the sun warmed rock occasionally caused isothermic snow, which meant sinking in up to two feet even with light packs. This also meant, though, that we would not need to break out the crampons and could just kick steps across the steep snow sections. Temperature was about 10 degrees, so not too hot, with brisk winds, just the way I like it. The summit was reached after traversing some steep snow slopes and then by following what amounted to a compacted scree path that is easily picked up once you reach the ridgeline cornices, as you bear right toward the summit. The crux, if there is one, is one simple unexposed step with hands on, or hands in pockets if you like, up a short scree gully. The summit of Sun God Mountain is 2421 metres high. There are commanding views in all directions. I had read that even Mt. Waddington could be seen from here but I had no idea where we should to look to find it. In the distance we could see many mountains that we knew well, and scores of others we had never seen before. This was a very wild place that sees perhaps not more than a couple of dozen people per year, but only the summit cairn suggested any prior human presence. One of my favourite photos of all time! After spending our usual twenty minute maximum on the apex we turned away reluctantly and headed back to the tents. The sun was dropping on the horizon as we strode toward the plateau, retracing our steps, which were now beginning to harden with the icy winds that had now returned to the ridge. Knowing that darkness would set in before too long, we also tried to pick up the pace just a little. Initially, we had also hoped to climb Seven O’Clock Mountain across the col, but that would have to wait for another time, perhaps the morning. Had we known how many photos would be taken on the way down we might have layered up a bit more quickly! The ever changing light had the skies changing colour quite often. It was 9 pm by the time we rolled into camp. The time had gone by quickly, as it often seems to do when you are enjoying the day. I’d almost say it was too cold to drink the beer we had stashed in the snow, but of course that would be far from the truth! Soon after, we settled in for the night. I was much more spent than usual after a hike, and it wasn’t long before I dozed off to a peaceful sleep. It was a very cold night, and neither of us was keen to wake up. I’m a notoriously early riser on most trips like this but not even I stirred until 7 am. That meant Seven O’Clock Mountain would wait till another day. Did I mention it was a cold night? The tents had a layer of frost on the outer flies and breakfast was made in a hurry to help warm us up. Soon enough, the sun rose and made its welcome appearance as we drank coffee and ate some oatmeal. Since Doug was to be back in Whistler to meet family, we packed up camp then carefully made our way down to the bikes, which was a dicier task on the now hardened snow. Next came a glorious ride down to the truck on our bikes, so much easier on the downhill! It was only once interrupted when we had to discharge a bear banger to clear a big and curious black bear off the road. Then it was lunch back at the truck and back on the road to civilization, weaving our way through the hordes of bike riders on the Sea to Sky Challenge, a local bike race taking place on the roads near Pemberton. An excellent trip, and I understand that now the road can be driven to where we rode, which saves a lot of wear and tear on the body. Still, highly recommended, however you manage to get up there! Thanks to friends Chris, Ryan, and Simon for information on the area, and to Matt for his fine description in the Scrambles Guide. It was September of 2012, and a run of near perfect weather gave rise to the idea of climbing Mt Gillespie, in the Mamquam River Valley of the Coast Mountains. Sitting on a high divide in Pinecone-Burke Provincial Park, it’s a handsome summit that can be seen from afar. It’s also surrounded by several pocket glaciers whose days may well be numbered. So it was that Ted, Denis- also known as “The Retreads”- and I were rolling up Highway 99 at the customary early hour, then turning into the shadows cast by the sheer walls of the Squamish Chief. We would need to travel quite some time on logging roads to reach our destination. Ted and Denis, clowning it up on the trail, on one of our other trips! But… “Whoa now, wait a minute!” You’re thinking. “What the heck is a retread?” Well, it’s a term that is, as far as I know anyway, coined by my longtime trail companions for this day. Denis explains a retread as a grizzled, old school, experienced mountain man who drinks beer, likes to joke, and never gives up till the job is done. There’s also an aspect of style to the term: retreads do not resemble today’s metrosexual genre, per se. As I’m fourteen years their junior, I sometimes get called a “pretread”, a retread in training, of sorts. Also, I get to be the expedition photographer, because, you know, I wouldn’t just do that anyway! These guys have known each other almost as long as I’ve been alive, and their long history makes for a wealth of experience and about as much laughter and tall tales as you can imagine. The stories were flowing freely that morning, so much so that we managed to miss the proper junction for the road we needed. It ended up that we inadvertently explored some newly cut logging spurs. An idle distraction that was, but we then had to double back to cross the bridge we passed, thus wasting about half an hour altogether. I was unperturbed by the delay or by our short attention spans, because it just gave me more time to hear more stories. Tom Fyles, above, was an old school hardscrabble B.C. climber also known as The Climbing Postman, and one of Ted’s all time favourites. He assures me Tom neither stretched nor did he ever put limes in beer! What was about two hours sped by as though it were half of that before we reached the trailhead. I had been there several years before and immediately noticed that the alder had reclaimed some sections of the road, but the water bars were still only a mild deterrent. After taking some time to gear up, we began forging our way up the rough route through the lower cutblock. To my chagrin, I noted that it had now been marked as a logging boundary, but to my knowledge it has not been harvested yet. If so, it would be a shame, as the old growth mountain hemlock forest makes for a scenic walk enroute to the meadows. The way to Gillespie is relatively straightforward. First you must attain Peak 5700 from the top of the proposed cutblock, and then you need to lose elevation into a gap before ascending to the alpine basin below Peak 6500 (sometimes known as Seed Peak). From there you wind your way through the ancient glacier that will yield the ridge that leads to Gillespie’s summit, at 2018 metres in elevation. There are amazing sights in all directions as soon as you gain the plateau below Peak 5700. You’ll note in this tale I sometimes refer to elevations in both feet and metres, so I apologize for the confusion. Ted and Denis are only reluctant converts to the metric system, and would be quite happy sticking to English measures. Being typically Canadian, I try to appease all parties! After a mere half hour of trekking, we climbed a steep hillock that gave us access to the summit of Peak 5700. It was an ideal vantage point, from which we caught our first glimpse of our objective. This valley has become a welcome place to me, even though my indoctrination to the region some years back with my good friend Chris B. It had been a day of foul weather and fleeing from bears, to exaggerate only mildly on both accounts. The previous excursions I had made there had given me a sense of familiarity, but more than that, the area has always seemed pleasant in nature to me. It’s hard to explain, almost as though there are good vibes there, or something like that. Mt Gillespie now took center stage as it appeared across the ridges. There were only mild technical difficulties on the next leg of the trip. The trail, if you can call it that, simply uses a high connecting bench that leads you to slopes below Seed Peak. Then, once you manage to arrive in the high alpine bowl above, you can plot your route to Gillespie. For a number of years I have wanted to make a point of camping here, as it has all the amenities of the finest wilderness campsites. There is abundant drinking water, and a few icy tarns to cool you off on those hot summer days too. The retreads, though, abhor overnight missions, preferring marathon marches, if necessary, to finish in a single day. Challenges would soon begin in earnest, however. Crossing the bench proved simple enough, but meandering down the granite slabs into the belly of the pocket glacier was next on the agenda. The photo below illustrates the task well. The glacier is an ancient one that has receded considerably, so we did not have to contend with any crevasses. There were dangerous moats where ice had melted away from the rock faces though, so those had to be walked with care. I am pretty sure this is the friendliest glacier I have ever hiked. The snow was in ideal condition and was never steep enough to require crampons. We simply strolled across it. 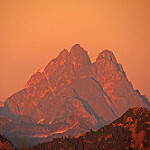 In the now approaching midday sun, the rock took on different tones, changing from pollished greys to browns and pinks. The glacial ice, too, was fascinating. In this photo you can see it has formed concentric patterns over the years. I’m not totally sure how that process would have occurred, but I guessed it had something to do with melting patterns. I had first heard of this mountain years before from good friend Simon, who had climbed it back in 2005. His description of the way up was quite accurate. We just climbed up to a broad ledge that gave way to a steep and somewhat loose section of scrambling. This was the key to the ridge. We marked our exit point with a cairn so as to make the trip back less complicated. The bottom of the ridge consisted of fairly simple hiking, with the odd bit of boulder hopping thrown in. In the home stretch now! What next? Eyeing the summit from the clearing, I figured a short walk on snows and then stick to the rock from there, to start with. The rocky field of boulders below the buttress above posed no issues at all. It wasn’t long after that we found ourselves gazing at the last of the obstacles that kept us from the summit. What was even better was that the views were opening up more with every step we took. The Mamquam Vallley is a sight to behold, highlighted by glacier clad Mamquam Mountain, which lies within Garibaldi Provincial Park.When we crested the boulder slope, we could see a very nice line up a snowfield that had remained hidden until then. Denis led the way, with the rays of the sun all the warmer. The crux turned out to be a short, narrow slot with almost no exposure which could be scrambled with ease. This completed, all that was left was to tag the summit. Ted, as it turned out, had worked with John Gillespie, whose father had been instrumental in lobbying for Pinecone-Burke to be set aside as parkland. The elder Gillespie had passed some years ago, but the mountain we stood atop had been named in his honour. A worn but well made little sign lay nearby as well. Here are some summit views! There was a large snowfield and a glacier on the other side of the mountain as well. Haze from recent forest fires hung over the mountains, but of course the views were still grand. Of course, we couldn’t stay there forever. Lingering on mountaintops much more than thirty minutes is frowned upon in the retread culture. I suspect this is mainly because the cold beer is back at the truck and, well, that reason’s good enough for me! Well, maybe one last summit shot before we head home! The idea was, of course, to retrace our steps from whence we came. On the way back we missed the cairn that marked the way and ended up casting about for alternative routes down to the glacier. The sight of November Lake brought to mind my friend Martin. He has a burning desire to pack inflatable rafts to alpine lakes, and I think he has his eye on this lake too. We explored several routes. One was a steep gully that looked loose and unsafe, so that was ruled out, then two more that ended in cliffs. We were about to reluctantly climb up and search for the cairn we had missed when Ted noticed a rocky gully that swung down to a moraine we could cross to get closer to the glacier. Attaining the glacier was somewhat tricky too, as there were moats to avoid, but finally an easy avenue appeared. We crossed the glacier once again, aiming again for the basin below Peak 6580 . Under ideal conditions, but as dictated by the objective, one of the chief designs of a retread’s day in the hills is to avoid vertical gain on the trip back. That was not to be possible on this day, as the ups and downs of these mountains meant there’d definitely be some hard work on the way home. Once at the basin we met some hikers with their dog who had climbed Peak 6500. I asked them if they had found the pair of sunglasses Doug had left there when we had hiked there three years before, but no luck there. Somewhere there’s a mountain goat strolling the hills up there with a nice pair of shades, I guess. The walk back up to Peak 5700 after descending the ridge below Peak 6500 was a bit of a chore for me. I’m not sure whether I managed to get dehydrated or what but I ended up with a sore quadricep for a week after this trip. We were all happy to make it back to the truck and down a few very cold Budweisers after roughly 7 1/2 hours on the trail. Retreads in training are also required to supply chips- plain or ripple but no flavours being preferred. A very rewarding day, good times! Doing what we do best! Myriad topics of conversation on the drive home included mountains, more mountains, wine, women, song, still more mountains, barrroom brawling, the NFL, softball, old western movies, beer, chips, more beer, and still more beer. Since the ride up had thoroughly shattered his beer glasses, Ted included one of these beers below to each of us as parting gifts. Add a total of 5 1/2 hours driving- longer still for the guys- and it made for a solid 14 hour day. If you have never visited this part of the Coast Mountains, you’re missing out on the very sublime experience that is the Mamquam Valley. Get up there soon! Well secluded in a remote corner of Mt Seymour Provincial Park is a 1508 metre peak that towers high above the Seymour Valley to its west and the waters of the Indian Arm to the east. That mountain is Mt Bishop, named for the first president of the British Columbia Mountaineering Club (the BCMC ). 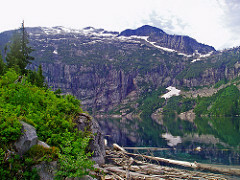 It was first ascended in 1908 via the Bishop Creek Valley from the shores of Indian Arm by a large party of climbers. One those was Fred Mills, a noted explorer of the North Shore Mountains and an early member of the British Columbia Mountaineering Club (BCMC). 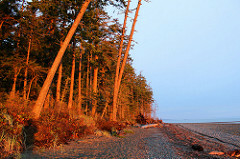 A place that still sees few if any visitors, Bishop and its slopes offer an authentic wilderness experience, despite the fact that Vancouver’s city lights can be seen distinctly from its lofty vantage. Here then, is a blended tale of a two treks I have made there, and of Mr Mills’ historical expedition. It was April of 2004. I was standing on the pedals of my mountain bike, picking up speed as I worked my way to the Mt Bishop trailhead, some 24 kilometres from my house, where the ride had begun. I had heard of a rough trail that had been blazed from the end of the Eastside Seymour Road in the Lower Seymour Conservation Reserve to the summit of Mt Bishop. The promises of massive old growth forest, subalpine lakes, and mountain meadows were running through my mind. Soon after reaching the 13 km mark on the road, I came to an abrupt halt. My information had the path beginning at the 12.8 km mark, so logically, I needed to backtrack. Soon, I sighted the markers. I wasn’t certain exactly how I missed the conspicuous tree festooned with bands of flagging tape, but there it was! After a short bikewalk I opted to stash my ride and commence hiking, but it was not long before I almost froze in my tracks. Something crackled loudly through the underbrush about fifteen yards to my right. It fell silent for a moment, then accelerated quickly through the forest cover with what sounded like a low growl, and then it was gone. I never did see what it was but I knew it was not a deer or a black bear. I concluded it may have been a cat of some kind, possibly a cougar or bobcat. My heart rate having returned to some semblance of normal, I continued onward. Only several minutes later, I came upon a magnificent grove of western redcedar. The largest of the trees approached four metres in diameter, and two were significantly old specimens, well in excess of 700 years old. I lingered for a time in the presence of these giants, then began hiking uphill again. Ropes were fixed on the difficult sections as the trail was as steep as its reputation! My trek was to last but half an hour more, as suddenly it dawned on me I’d be late if I did not turn around. A brisk walk turned into a run, and then a hurried ride home. One thing was sure, though, I was hooked and vowed to return! Flash back to the summer of 1908. To me, a year of significance, as my grandmother was born then in New York City and the house I used to live in was built in that year. The Mills Party, for their part, made camp at the mouth of Bishop Creek across from Croker Island, near the turn of the twentieth century. They ascended all the high peaks in the area, including Mt Jarrett and Mt. Elsay. Jarrett and Bishop were both climbers in this BCMC group, though Mills did much of the leading. The region was roadless then, so their method of transport was by boat from Indian Arm. After walking the ancient forest of cedars, they attained a hogback ridge that gave them passage to the alpine and the summit of Bishop. The other peaks were accessed from that region, and all climbers returned to camp that evening before returning homeward. It was, without a doubt, a full and successful day! Fast forward to 530 am, July 30 of 2004, and another heinously early start for Doug and me, just two weeks to the day from our traverse of The Needles. Would today prove similar? Read on and discover…. As we arrived at the trailhead, it was by then 7 pm, and the rising sun was beginning to cast shadows on the fast awakening valley. The bikes having been locked away, it was time to walk through the aging giants that would give way to the upper valley. The Bishop Trail had originally been blazed by Denis Blair, Jim Sedor, and Moe Lamothe, avid mountaineers all. In the years since then I have been on quite a few treks with Denis, who, it must be said has become something of a mentor for me. He has forgotten more about the mountains than I’ve ever known and is still climbing strongly in to his seventies, no mean feat here in the steep Pacific Northwest! Later the trail was adopted by local climbing legend Don McPherson, who improved it while clearing an access route to the Indian Arm Trail, and finally by North Shore Search and Rescue, who planned to use it to evacuate injured hikers. The jungle gym qualities of this trail were as immediately apparent to Doug as they had been to me several months before. The ever popular Grouse Grind, also built by McPherson, ascends 890 m over 2.9 kms, but the Bishop Trail climbs 1268 m over 3.25 kms, not for the faint of heart. It was good clean fun and plenty of effort to make our way up that trail! Once we made it to 700 m above sea level and a fine view of Cathedral Mountain, the route was new to both of us. In short order we reached a clearing which gave way to a broad basin with several subalpine ponds. We knew that the largest of them must be Vicar Lake, and that the worst of the battle was done. The peak lay another hour above the lakes, and its unmistakably rounded summit was now within sight. We lingered for a while at the lakes, before taking once again to the woods. It was an ideal place to stop for lunch. The forest was now an old grove of Mountain Hemlock dotted with sizable, silvery trunked Yellow Cedars.One in specific, named The Bishop Giant, was over eight feet in diameter,over 800 years in age, and in near perfect health. As you can see in the two photos above, the upper section of the trail begins at this metal marker on the shore of Vicar Lake, from which you also have a fine view of Mt Elsay. The next section of the route wound through ever thinning forest along Gibbens Creek until it emerged on the ridge, where the views expanded. The weather was warm, but not as oppressive as it had been earlier that month, so that the hike was quite comfortable. This was a beautiful section of the trail. Heather clad meadows and thick, stunted hemlock were the order of the day there. There was little left to do but scale the granite blocks that led ever higher. The hiking here was not difficult, with only the occasional bit of scrambling to be done. The lower reaches of the trail provided much more of a challenge than the alpine reaches did, as it turned out. In twenty more minutes we stood at the apex, Mt. Bishop was ours to share, if only for a while. We wandered around the summit and took a well deserved break! Gnarled and ancient Mountain Hemlock guards the summit area. If ever there was such thing an ent, this is it! We spent a relatively short time on the peak, eating the rest of the homemade pizza (thanks to my wife) and absorbing the absolute quietude, before traipsing back to the bikes again. Here are some summit shenanigans…. The clouds also made for some interesting photo opportunities! As we began the trip back down the valley, more cloud cover rolled in, but no rains came with it. A little reluctant to leave the alpine, we took our time through the meadows. In the intervening years since Mr Mills led the first ascent, this mountain has not changed substantially. On almost any given day, one would find it without the company of humans. At one time the wildlife population was supposedly more abundant, yet we found the tracks of many deer, mountain goats, and of several black bears on our travels that day. It was about half an hour before we had made it back to Vicar Lakes again. Though gravity always makes descents somewhat easier, that doesn’t necessarily mean they’ll take less time. What with all the obstructions, ropes, and rockbands the Bishop Trail has, it took us nearly as much time to return to the trailhead from the lakes as it did to make the same distance uphill. That’s not unusual for the North Shore Mountains, where there’s seldom an easy way. By the time we reached the truck, over ten hours had passed. It had been a lengthy and strenuous day. Over 30 kms of biking and another 8 kms of hiking all told. A highly recommended trip, by my account. We certainly appreciated that when Mr Mills and his party made their foray, they didn’t have a chance of completing their climb as a day trip. It likely took an extra day of travel by horse and boat just to establish their basecamp. Determination was needed in greater supply in 1908! For some time I have wanted to kayak my way up the Indian Arm and recreate their expedition, and hopefully that day will come. Until then , when I walk up Mt Seymour or drive the Barnet Highway along the Burrard Inlet, the sight of Mt Bishop will always trigger fond memories.